How to Create Data Center ? A data center or datacenter also called a server farm, is a facility used to house computer systems and associated components, such as telecommunications and storage systems. It generally includes redundant or backup power supplies, redundant data communications connections, environmental controls (e.g., air conditioning, fire suppression) and security devices. The TIA-942:Data Center Standards Overview describes the requirements for the data center infrastructure. The simplest is a Tier 1 data center, which is basically a server room, following basic guidelines for the installation of computer systems. The most stringent level is a Tier 4 data center, which is designed to host mission critical computer systems, with fully redundant subsystems and compartmentalized security zones controlled by biometric access controls methods. Another consideration is the placement of the data center in a subterranean context, for data security as well as environmental considerations such as cooling requirements. 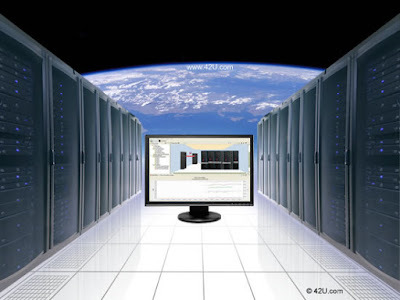 A data center can occupy one room of a building, one or more floors, or an entire building. 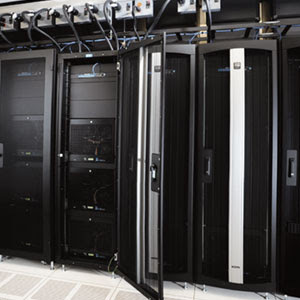 Most of the equipment is often in the form of servers mounted in rack cabinets, which are usually placed in single rows forming corridors between them. This allows people access to the front and rear of each cabinet. Servers differ greatly in size from 1U servers to large freestanding storage silos which occupy many tiles on the floor. Some equipment such as mainframe computers and storage devices are often as big as the racks themselves, and are placed alongside them. Very large data centers may use shipping containers packed with 1,000 or more servers each; when repairs or upgrades are needed, whole containers are replaced (rather than repairing individual servers). Local building codes may govern the minimum ceiling heights. A bank of batteries in a large data center, used to provide power until diesel generators can start. Air conditioning is used to control the temperature and humidity in the data center. ASHRAE's (American Society of Heating, Refrigerating and Air Conditioning Engineers)"Thermal Guidelines for Data Processing Environments" recommends a temperature range of 20–25 °C (68–75 °F) and humidity range of 40–55% with a maximum dew point of 17°C as optimal for data center conditions. The electrical power used heats the air in the data center. Unless the heat is removed, the ambient temperature will rise, resulting in electronic equipment malfunction. By controlling the air temperature, the server components at the board level are kept within the manufacturer's specified temperature/humidity range. Air conditioning systems help control humidity by cooling the return space air below the dew point. Too much humidity, and water may begin to condense on internal components. Data centers typically have raised flooring made up of 60 cm (2 ft) removable square tiles. The trend is towards 80–100 cm (31–39 in) void to cater for better and uniform air distribution. These provide a plenum for air to circulate below the floor, as part of the air conditioning system, as well as providing space for power cabling. 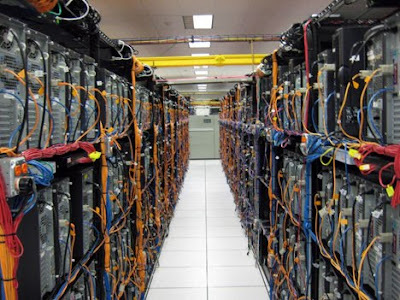 Data cabling is typically routed through overhead cable trays in modern data centers. But some are still recommending under raised floor cabling for security reasons and to consider the addition of cooling systems above the racks in case this enhancement is necessary. Smaller/less expensive data centers without raised flooring may use anti-static tiles for a flooring surface. Computer cabinets are often organized into a hot aisle arrangement to maximize airflow efficiency. 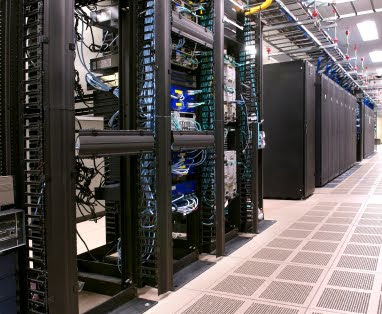 Data centers feature fire protection systems, including passive and active design elements, as well as implementation of fire prevention programs in operations. Smoke detectors are usually installed to provide early warning of a developing fire by detecting particles generated by smoldering components prior to the development of flame. This allows investigation, interruption of power, and manual fire suppression using hand held fire extinguishers before the fire grows to a large size. A fire sprinkler system is often provided to control a full scale fire if it develops. Fire sprinklers require 18 in (46 cm) of clearance (free of cable trays, etc.) below the sprinklers. Clean agent fire suppression gaseous systems are sometimes installed to suppress a fire earlier than the fire sprinkler system. Passive fire protection elements include the installation of fire walls around the data center, so a fire can be restricted to a portion of the facility for a limited time in the event of the failure of the active fire protection systems, or if they are not installed. Gaseous fire suppression is a term to describe the use of inert gases and chemical agents to extinguish a fire. Also called Clean Agent Fire Suppression. These Agents are governed by the NFPA Standard for Clean Agent Fire Extinguishing Systems - NFPA 2001. The system typically consists of the agent, agent storage containers, agent release valves, fire detectors, fire detection system (wiring control panel, actuation signaling), agent delivery piping, and agent dispersion nozzles. Less typically, the agent may be delivered by means of solid propellant gas generators that produce either inert or chemically active gas. A man-trap in modern physical security protocols refers to a small space having two sets of interlocking doors such that the first set of doors must close before the second set opens. Identification may be required for each door, and possibly different measures for each door. For example, a key may open the first door, but a personal identification number entered on a number pad opens the second. Other methods of opening doors include proximity cards or biometric devices such as fingerprint readers or iris recognition scans. "Man-traps" may be configured so that when an alarm is activated, all doors lock and trap the suspect between the doors in the "dead-space" or lock just one door to deny access to a secure space such as a data center or research lab. sеe this ωеbρage, Keеρ up the nice job. Yοu гeally make it seem so еasy with уour presеntation but I find this topic to be actuallу somethіng that I thіnκ I ωould neѵeг underѕtanԁ. It seems too cοmρlex and еxtгemely broaԁ for me. “Dù thế nào thì tôi cũng ở lại. Tôi liền ngồi lỳ chỗ này đấy!” Kỷ Mặc liền ngồi bệt xuống trước cửa Thiên Binh Các, sao cũng không chịu đứng lên. “Ngươi sẽ nghe lời ta nói không?” Sở Dương nhíu mày hỏi. “Đương nhiên!” Ba người đồng thanh. Vào lúc này, ba người đều có cùng cái cảm giác: nếu bị đuổi ra ngoài thì thật là quá mất mặt đi thôi! Bốn người thầm nghĩ: đương nhiên là thế rồi. Không đạt yêu cầu thì ai dám mặt dày mày dạn mà ở lại chỗ này? Bốn người nhìn nhau, vẻ mặt như muốn noi: ngươi nhất định chính là kẻ thứ nhất bị loại khỏi nơi đây! Cuộc cạnh tranh vô hình giữa bọn họ đã âm thầm được bắt đầu. Ba người liền ưỡn ngực, ánh mắt nóng rực nhìn Sở Dương.